February 11th is the International Day of Women and Girls in Science and Exploring by the Seat of Your Pants celebrated last year with a full day of Google Hangouts with leading women in science and exploration. This time around we're devoting the entire month to celebrating amazing women in science, exploration, adventure and conservation!!! Follow this page for the next two weeks as the speakers, dates and times are filled in. Book your camera spots now! Stay tuned, more events being announced daily! Mylène Paquette discovers the world of navigation during a family getaway on Lake Champlain in 2005. 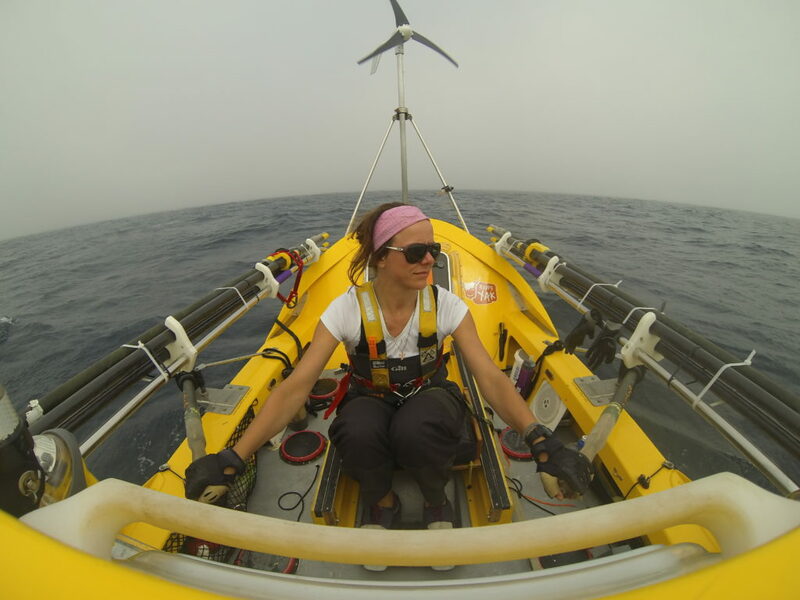 This revealing experience will lead her to become passionate about ocean rowing. During that period, Mylene works as a beneficiary attendant for sick children at Sainte-Justine hospital. A discussion with a young patient will change her life forever and lead her to overcome her fears and finally, to realize her dreams. After a 5-year preparation, she crosses the North Atlantic Ocean in 129-days. Today, in the context of her social involvement and for the environment cause, she shares her incredible experience. Emily Penn is an oceans advocate, skipper and artist; a graduate of Cambridge University with a degree in Architecture. She has organised the largest ever community-led waste cleanup from a tiny Tongan island, trawled for micro plastics on a voyage through the Arctic Northwest Passage, rounded the planet on the record-breaking biofuelled boat Earthrace, and worked on a sailing cargo ship trading western supplies for coconuts. Emily splits her time between running eXXpedition - a series of all female voyages which focus on the relationship between plastics and toxics and female health - and working on solving the ocean plastics issue with Parley for the Oceans and other corporate clients. Prior to this, Emily co-founded Pangaea Explorations, to enable scientists, filmmakers and everyday people gain access to the most remote parts of our planet; collecting data on global issues and along the way discovered previously unknown oceanic gyres – huge areas of plastic pollution accumulation. Creative conservationist Asher Jay is an international adventurer whose paintings, sculptures, installations, animations, ad campaigns, and films all have a single purpose: to incite global action on behalf of wildlife conservation. Much of her best-known work spotlights the illegal ivory trade, including an animated billboard in Times Square and a project aimed at China's ivory-hungry rising middle class. Asher's travels have made her a witness and story-teller; she has combatted illegal wildlife trafficking, promoted habitat sanctuaries, and illuminated humanitarian emergencies. Her core message is about biodiversity loss during the Anthropocene—the “Age of Man”. Originally from Calgary, Canada, Marina Elliott is now a Researcher at the University of the Witwatersrand in South Africa. She did her Masters of Arts and PhD in biological anthropology and archaeology at Simon Fraser University in British Columbia, Canada. Marina has excavated ancient human remains in Western Canada, the USA and Siberia. She has also assisted with modern forensic investigations in Canada, the USA and Switzerland. In 2013 she became one of six “Underground Astronauts” to excavate more than 1500 fossil specimens from a cave deep underground in South Africa. The find is one of the largest single assemblages of fossils in the world and resulted in the naming of a new species of human relative: Homo naledi. She is a Fellow of the Explorers Club and was recently named a National Geographic Emerging Explorer. Lilly is originally from Tofino, British Columbia, but has lived most of her life by the Great Lakes in rural Northern Ontario. Upon moving back to the coast at 18, she fell in love with the pursuit to protect the environment, and ended up doing a Double Major in Environmental Studies and Cinema Studies at the University of Toronto. Since graduating in spring 2015, she has worked on a diversity of campaigns including wild salmon protection and mining. She has also worked for Greenpeace in New Zealand in 2016/2017 with the aim of stopping offshore drilling and seismic blasting. In April 2017, she landed a dream job as the Chapter Manager for Surfrider Pacific Rim, which has the current aim of eliminating single use plastics, implementing progressive recycling practices for petroleum products, and working with the public, youth and businesses through programs and events that raise awareness about coastal stewardship and ocean friendly behaviours. Erika is a submersible pilot, a virtual reality engineer, and an enthusiastic ocean explorer. She began her career in chemical oceanography, studying at the University of Washington, while working as a diesel engineer and a steam ship engineer. In 2013 she received a National Geographic grant for her "Classrooms Under the Sea" expedition to live stream video from submersibles. 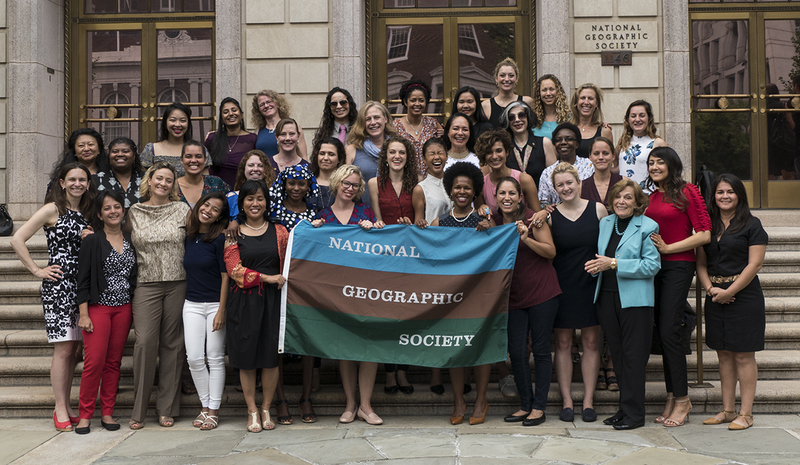 Weaving together her passions for submersible engineering, rich media storytelling, and outreach, she founded Global Engineering & Exploration Counselors (GEECs) to provide a network of engineering camps and mentorship to girls around the world. In fact, Erika is running one of her camps right now and we're going to join her there to learn about her adventures as a submersible pilot and meet some of the campers taking part in the engineering camp. Erin Spencer is a science communicator who uses photography and writing to share stories of community-based invasive species management around the world. A two-time National Geographic Young Explorer Grantee, Erin's work primarily focuses on innovative responses to invasive lionfish in the Western Atlantic and Caribbean. In 2014, Erin launched the Invasive Species Initiative, a website that uses digital storytelling to share grassroots approaches to invasive species management. The project aims to educate followers about the impacts of invasive species and provide them with tangible tools they can use to combat invasives in their own communities. She's traveled from Florida to Fiji in search of creative ways people are combatting invasive species in their backyards. A newly named National Geographic Emerging Explorer, Grace spent the summer working with NASA's Frontier Development Lab creating 3D models of asteroids. She earned her BSc in mechanical and ocean engineering at MIT and is currently a Marshall Scholar and PhD candidate with Oxford University’s Ocean Research & Conservation Group. An avid sailor and diver, she’s participated in five marine expeditions on four continents. Her work experience includes helping to design, build, and text submersible and aerial robots that have deployed in the Arctic, Antarctic, Atlantic, and Pacific Oceans. In 2014 she was an aquanaut on Fabien Cousteau’s Mission 31, living and working on the ocean floor for two weeks in the Aquarius underwater lab. Grace will speak to students about marine robotics and the future of ocean exploration. From Greenland to Alaska, according to Inuit legend, Sedna is the Inuit goddess of the sea and the mother of all marine mammals. Team Sedna’s women ocean scientists, explorers, movie-makes, photographers, educators and scuba diving professionals use underwater robots equipped with video-cameras and touch aquariums temporarily populated with sea critters to "bring the ocean to eye level" for the largely non-swimming Inuit youth of Labrador and Nunavut, Canada. Taking experiential learning to the next level, Sedna's sea women lead Inuit Elders and girls on snorkel safaris in arctic waters, exploring the marine biodiversity that lies beneath the waves in their back yards. Inuit societies are matrilineal in structure, and women are the natural leaders. Team Sedna’s sea women hope to inspire the next generation of Indigenous women leaders to think big, equipping them with the tools and skills to mitigate the impacts of climate change, ocean change and societal change in their remote northern communities. Come explore arctic waters with Sedna’s sea women! Linguistic anthropologist Sandhya Narayanan grew up living between Toronto, Ontario and Boston, MA; in a multilingual home and in multilingual communities. This experience helped draw Sandhya to study how language use and linguistic differences have shaped and continue to influence social and cultural changes in human populations. As a 2014 National Geographic Young Explorer, Sandhya studied Quechua-Aymara indigenous language contact (how languages influence each other over time), multilingualism, and language and culture change along the Lake Titicaca basin on the Peru-Bolivia border. She is committed to understanding how linguistic diversity and multilingualism is maintained in diverse communities around the world and to spreading awareness about language use in the world we live in today. Carol Devine is a humanitarian, social scientist and a member of the Society of Women Geographers. Carol works for Doctors Without Borders/Médecins Sans Frontières because she believes everyone should have access to medicine. She has joined three civilian ocean cleanup projects and most recently one all-female sailing expedition called eXXpedition that circumnavigated the United Kingdom surveying plastics in waterways and researching the impact of plastic pollution and toxins on health. Carol led the first civilian cleanup expedition to the Antarctic in collaboration with the Russian Antarctic Expedition and co-wrote a cultural history book about it, The Antarctic Book of Cooking and Cleaning. Carol shares stories and sciart about ocean, planetary and global health. Gaelin is a marine scientist, explorer, photographer and filmmaker and founder of Global Ocean Exploration Inc. Always fascinated by the marine world, Gaelin began diving at 14 and has since continued exploring ocean ecosystems. She began her career at the Woods Hole Oceanographic Institution where she researched over-wintering patterns of Southern Ocean zooplankton. Gaelin earned her Master’s Degree in Coastal Environmental Management from Duke University working with the Tag-A-Giant program and conducting research on the migratory movements of Giant Bluefin Tunas. She has conducted fieldwork throughout the world from the Antarctic to the Arctic on icebreakers to both the Pacific and Atlantic Oceans on fishing vessels. She is a US Coast Guard Licensed Captain, and a Fellow of both the Royal Geographical Society and the Explorers Club. To Gaelin, there is nothing better than being in the open ocean surrounded by endless blue water and passing wildlife. Photographer and conservationist Gabby Salazar travels around the globe to document rare and endangered species and to raise awareness about environmental issues. She is a National Geographic Explorer, a former President of the North American Nature Photography Association, a U.S. Fulbright Scholar in Photography, and an Associate Fellow of the International League of Conservation Photographers. At age 19, she founded a student magazine with Nature's Best Photography to promote photography as a way to connect kids with nature. She continues to teach photography to children and teenagers around the world. See more of her work at www.gabbysalazar.com. After working in finance for 8 years, Sarah quit her city job in 2013 and spent 18 months travelling the world, climbing Kilimanjaro, backpacking around South America and doing a ski season. She set up Tough Girl Challenges in 2014 as a way of motivating and inspiring women and girls. Sarah hosts the Tough Girl Podcast where she interviews inspirational female explorers, adventurers, athletes and everyday women who have overcome great challenges. The podcast is listened to in 174 countries around the world and will soon reach 500,000 downloads. In April, she completed the Marathon des Sables and in 2017 hiked the Appalachian Trail (2,190 miles) in 100 days! MIT engineer turned science communicator. Host & Producer of FOX's Xploration Outer Space, Correspondent on Bill Nye Saves the World, Author of STEM book series The Ada Lace Adventures. In addition to writing, Emily is a professional speaker and gives talks on the topics of space exploration, scientific literacy and equality. Emily is wildly passionate about space exploration. Through her show, she wants to prove that the space industry is more exciting today than ever before in history. She wants to inspire more females to pursue STEM careers. She believes most young students, especially women and minorities, don't realize how many amazing, creative, and often free opportunities exist for students who pursue STEM majors. Sarah Outen is an adventurer by land and sea, bestselling author and motivational speaker. Keen to encourage people outside and enable young people to access adventure, she is a proud ambassador and patron of a number of charities. In November 2015 Sarah completed her most recent major expedition: London2London:Via the World, an attempt to row, cycle and kayak 25000 miles around the Northern Hemisphere. The journey took 4.5 years and was all the richer for not turning out exactly as planned. She set off on 1st April 2011 from London’s Tower Bridge on her expedition to cycle, row and kayak a continuous loop of the world. 2012′s Pacific attempt was ended short by Tropical Storm Mawar. In the spring of 2014 she returned to the Aleutian Islands with her kayak and paddled 1,500 miles to mainland Alaska. She then jumped on her bike and cycled 5,000 miles across North America. From there she rowed over 3600 miles of Atlantic Ocean. Dr. Ayana Elizabeth Johnson is a marine biologist, policy expert, conservation strategist, and Brooklyn native. She is founder of Ocean Collectiv, a strategy consulting firm for conservation solutions grounded in social justice. She teaches at New York University as an adjunct professor, and volunteered as co-director of partnerships for the March for Science. As executive director of the Waitt Institute, Ayana co-founded the Blue Halo Initiative and led the Caribbean’s first successful island-wide ocean zoning effort. Previously, she worked on ocean policy at the EPA and NOAA, and was recently a TED resident and Aspen Institute fellow. Ayana earned a BA from Harvard University in Environmental Science and Public Policy, and a Ph.D. from Scripps Institution of Oceanography in marine biology. Nadine has been a resident astronomer at the Canada-France-Hawaii Telescope (CFHT) since 1999. After her studies in physics at Universite de Montreal and countless nights spent observing young stars at the Observatoire du Mont Megantic (Quebec), Nadine earned her PhD and flew to Hawaii. She currently is the Instrument Scientist for one of the 5 CFHT instruments, oversees the observing process to ensure all observations taken at the telescope maximize the scientific return, and is involved in outreach activities. Sophie is a former ballerina turned award winning explorer and water advocate. Sophie is a UN Youth Delegate, Fulbright Scholar and the 2017 New Explorer of the Year. Sophie holds a 200-ton captains license - at the time of certification, she was the youngest female to ever obtain this rank. As the Founder of AquaAid International, Sophie works with some of Central America and Sub-Saharan Africa’s most remote villages establishing sustainable sources of clean drinking water. Sophie uses exploration and storytelling to inspire action to create a more sustainable future. Her passion for adventure and discovering indigenous ways of life has led her undertake descents of uncharted rivers in Madagascar, desert transect treks in Namibia, and ethnographic research in the Republic of Vanuatu. Katy Croff Bell is an ocean explorer, using deep sea technology to explore what lies at the depths of the ocean. For more than 15 years, she has participated in or led more than 30 oceanographic and archaeological projects. Previously, her work involved the utilization of telepresence technology on ocean exploration projects for remote science and education. She worked with a large team to implement this technology on multidisciplinary expeditions around the world aboard Exploration Vessel (E/V) Nautilus. Currently she is developing a partnership between National Geographic and the MIT Media Lab. Katy received her S.B. from MIT in Ocean Engineering in 2000. In 2001, she was a John A. Knauss Marine Policy Fellow in the NOAA Office of Ocean Exploration. She is a 2006 National Geographic Emerging Explorer and 2014 MIT Media Lab Director's Fellow. Jenny has spent her life in, on, and surrounded by water. Her love for the ocean growing up inspired her to study marine biology in college. Exploring the threats to Florida's freshwater springs led her to become a conservation photographer and to pursue a PhD at the University of Florida, where she is blending science, writing, and photography to communicate about the water hidden in aquifers beneath our feet. Jennifer is a National Geographic Young Explorer and is currently working on an environmental education project called Walking on Water, which immerses elementary school students in the springs, cameras in hand, and teaches the next generation about freshwater. Last summer, she developed the first 360-virtual tour of the Floridan Aquifer, which she uses to bring kids cave diving and teach Floridians about their most vital resource. Alizé Carrère is a National Geographic Explorer researching and documenting climate change adaptation in practice. Raised in a treehouse in Ithaca, New York, her childhood primed her for a unique perspective on what it means to innovate and adapt in response to environmental change. n 2012, Alizé received support from National Geographic to conduct research in Madagascar, where she spent several months uncovering an unlikely agricultural adaptation in response to severe deforestation. Learning of farmers who were turning erosional gullies into fertile pockets of farmland, her work evolved into a greater story of creativity and resourcefulness amongst the oft-repeated narrative of climate doom. She continues to spearhead research on innovative adaptations to climate change, and is working with a film team on a web series that highlights the remarkable resilience of the human species. Dr. Parshati Patel is an astrophysicist and a science communicator. She received her Hons. B.Sc. in Physics and Astronomy from University of Toronto, and M.Sc. and Ph.D. in Astronomy and Planetary Science & Exploration from Western University. Dr. Patel investigates disks around young, massive stars. These stars are more massive than our Sun and are very young i.e. just starting to form a star. As the disks of dust and gas around these stars are a hub for formation of planets, studying these disks help us understand about the planet formation process among variety of stars. During her graduate studies, she realized her passion for science communication and public engagement while working in various astronomy and planetary science outreach programs. She currently works as an Outreach Program Coordinator at the Centre for Planetary Science and Exploration at Western University. Shannon is a waterwoman, photojournalist, and social ecologist from San Diego, California. Her research blends theory and practice from the fields of anthropology, psychology, and marine ecology to address today’s most pressing marine conservation issues. Shannon works with coastal communities in Southeast Asia and Oceania to understand how they can most effectively manage their resources to sustain both prosperous livelihoods and a healthy environment. As a PhD student in the Emmett Interdisciplinary Program in Environment and Resources at Stanford University, she explores new research methods using film and photography to engage community members as active participants in the research process. She is currently preparing for a year of field work living and conducting research with the traditionally nomadic Sama-Bajau fishermen of Eastern Indonesia. An avid ocean explorer, Sarah searches for life in areas of the ocean that have never before been seen by the human eye. Her passions lie in researching the dynamics of habitats fueled by chemicals, instead of the sun, and in thinking of how these habitats relate to the possibility of life on other planets. Currently pursuing a PhD in Ocean, Earth, and Atmospheric Science at Oregon State University, she integrates techniques of microbiology, geochemistry, and ecology to study the intricacies of life in chemically fueled ecosystems known as methane seeps. In studying these habitats, she has embarked on multiple month-long expeditions in the Pacific and Arctic Oceans, dove under meters of sea ice in Antarctica, and explored thousands of meters below the sea surface with remotely operated vehicles. Sarah actively works with organizations such as the Ocean Exploration Trust to connect with the public and inspire young scientists. Tierney was born in California. As soon as she could walk, her parents slipped her into a homemade wetsuit and tossed her into the surf. She's a marine biologist, National Geographic Explorer, certified seaplane pilot and diver. Since 2000, Tierney and her colleagues have been traveling the world's oceans studying the giant ocean sunfish (mola). Though these fish can grow more than ten feet (three meters) long and weigh over 5,000 pounds (2,270 kilograms), little is known about them. By placing high-tech satellite tags on molas and collecting tissue samples for genetic and pollutant analysis, Tierney and her colleagues hope to uncover the molas' secrets: How did they come to occupy all tropical and temperate seas? Where, when and at what size do they reproduce? How do they locate their jellyfish prey? Are there more ocean sunfish species yet to be discovered? Are their populations endangered? How can they help us understand the changing oceans?